The Waterbury Directory of 1905, shows that Percy was a member of the Improved Order of Red Men. Haymakers, Tunxis Association-meets first and third Thursdays of each month in Red Men's Wigwam, Citizen's Bank Building. Chief Haymaker , E. M. Clarke; Collector of Straws, H. C. Blake; Keeper of Bundles, Percy Mahoney.21 The National Haymakers' Association was a side degree of the improved Order of Red Men, similar perhaps to the Shriners within Freemasonry. It was founded in 1879, but may be completely inactive and defunct today. Meeting places were titled Haylofts. Sometimes, the meeting halls of the redmen served as Haylofts. Offices had titles like " Collector of Straws" and "Guard of the Barn Door", and candidates for initiation were styled "Tramps" and were overseen by a "Boss Driver". The organization is mysterious and poorly known. Percy Mahony, age 27, appears as head of household in the census of 25 April 1910 in 49 Wood Street, Waterbury, Connecticut, with Beatrice Aida Smith and Bernice Ruth Mahony.4 Percy Mahony and Beatrice Aida Smith resided in April 1910 at 49 Wood Street, Waterbury, Connecticut, and their daughter, Bernice.4 The Improved Order of Red Men is a Fraternal Organization established in Baltimore, Maryland in 1834. Their rituals and regalia are modeled after those used by native people of North America. The order itself claims direct descent from the Sons of Liberty, noting that the Sons participated in the Boston Tea Party dressed as Native Americans. Thus, they continue to dress as native Americans and are organized into tribes and such. Their ladies' auxlliary is the Degree of Pocahontas. They sponsored two youth organizations, the Degree of Hiawatha for boys and the Degree of Anona for girls. 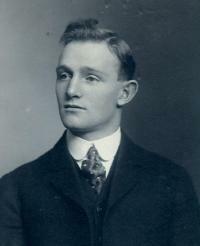 The organization claimed a membership of about half a milllion in 1935.23 Percy Mahony was associated in 1912 at Waterbury, Connecticut, The Improved Order of Red Men. Meets first and third Tuesdays of each month in Red Men's Wigwam, Citizen's Bank Building. Chief Haymaker, A.T. Fossum; Collector of Straws, E. M. Clarke; Keeper of Bundles, Percy Mahoney.24 He was associated in 1912 at Waterbury, Connecticut, Improved Order of Red Men. Percy Mahony and Beatrice Aida Smith resided in 1912 at 50 South Wilson Street, Waterbury, Connecticut, with their daughter, Bernice, and Beatrice's mother, Hannah Smith.25 Percy Mahony was associated in 1913 at Waterbury, Connecticut, The Improved Order of Red Men. Tunxis Tribe, No 10-instituted December 15, 1889. Meets every Tuesday in Red Men's Wigwam, 79 North Main Street. Sachem, C.L. Clark; C.of R., E.M. Clarke; C. of W., W.F. Engert; K of W., P. Mahoney.26 He was associated in 1913 at Waterbury, Connecticut, The Improved Order of Red Men. Percy Mahony and Beatrice Aida Smith resided in 1913 at 50 South Wilson Street, Waterbury, Connecticut, with Beatrice's mother, Hannah Smith.27 Percy was going bald. He had a moustache. Gram said that they used to have a place or area on mugs for moustaches so they wouldn't get all wet.6 Percy Mahony was associated in 1914 at Waterbury, Connecticut, The Improved Order of Red Men. Meets first and third Tuesdays of each month in Red Men's Wigwam, 79 North Main Street. Chief Haymaker, F.A.Wells; Collector of Straws, E. M. Clarke; Keeper of Bundles, Percy Mahoney.28 He was associated in 1914 at Waterbury, Connecticut, The Improved Order of Red Men. Percy Mahony resided in 1915 at 383 Wilson Street, Waterbury, Connecticut.30,31 (an unknown value. )32 The 1915 Waterbury Directory shows the following: The Improved Order of Red Men. Tunxis Tribe, No 10-instituted December 15, 1889. Meets every Tuesday in Red Men's Wigwam, 79 North Main Street. Sachem, C.L. Merrills; C.of R. E.M. Clarke; C. of W., W.F. Engert; K of W., P. Mahoney.33 He was associated in 1915 at Waterbury, Connecticut, The Improved Order of Red Men. [S611] Percy Mahony, Birth Certificate (4 December 1882). [S250] Percy Mahoney's Death Certificate. [S611] Percy Mahony, Birth Certificate, shows father as Joshua Mahony (4 December 1882). [S283] Joshua Mahoney household, 1900 United States Federal Census, New Haven, Connecticut, population schedule, Waterbury, ED 422, sheet 18, dwelling 270, family 401, shows the son of Joshua Mahoney as Percy Mahoney. [S611] Percy Mahony, Birth Certificate, shows mother as Lizzie Mahony, formerly Littlehales (4 December 1882). [S283] Joshua Mahoney household, 1900 United States Federal Census, New Haven, Connecticut, population schedule, Waterbury, ED 422, sheet 18, dwelling 270, family 401, shows birthdate as COtober 1882, age 1,7 and birthplace as England. [S284] Percy Mahony, 1910 United States Federal Census, New Haven, Connecticut, population schedule, Waterbury, ED 465, sheet 17B, dwelling 148, family 359, shows age 27. [S250] Percy Mahoney's Death Certificate, shows his birthdate as YEAR: 1882, MONTH: 10, DAY: 27 in Sheffield, England. [S577] Joshua and Lizzie Mahony and two children, S. S. Adriatic Passenger and Crew Lists of Vessels Arriving at New York, 20 April 1883; Microfilm serial: M237, Microfilm Roll:M237_463as viewed on Ancestry.com. [S428] The Waterbury Republican, September 1915, shows that the funeral will tale place from his late home 383 Wilson Street. [S209] Waterbury, Connecticut City Directory, Book Section M, Page 229. [S250] Percy Mahoney's Death Certificate, shows Riverside Cemtery as Burial Place.